LOVE the Christmas cantata performance!!!!! Madison, you don’t need a hat, you are plenty snappy in your pretty Santa coal. Madison is such a ham!! Thanks Madison, And Merryn Christmas to you and MOM too. Oh, Madison, what I’d like is for you to come for a a visit. I’m moving in to a new place and I bet you’d be a lot of help! Madison, you are such a love! If you ever want to go on vacation, I’d love to have you visit for a week or so and my two kitties will keep you entertained. Thanks for the note Madison – oops! – “Santa dog”! Wish your mom a very happy Christmas for me. Thank her too for sharing that video – it was so much fun! Madison, I know it is the time of year to be kind to everyone..*however* when I buy special food for the squirrels and they *insist* on eating from the bird feeder I have a problem blessing them. Dear Madison: Tell Mom that I really enjoyed the video…especially since I went to a Christmas Choir Concert, and that was the song the whole audience tried to sing. I have sent the video to the choirmaster…maybe next year??? Merry Christmas Madison and Ami! Enjoy your family time together. Well, Madison, I just think you look so nice in your Santa suit. And, frankly the hat is over-rated. We don’t wear Christmas costumes here. Mom tried to get us to wear the “hat”, too, but we didn’t like them either. Have you done any cookie baking there? It’s way more fun than wrapping presents. The crumbs are just delicious, something is always falling on the floor. And the house just smells delicious. We’ve been good dogs so we’re hoping Santa will be dropping by with a treat or two. We hope he visits your house, too. We have lots of very fat squirrels around our house because we had a banner year for hedge apples and squirrels apparently love hedge apples. Deer like them also. My traveling prevents me from having a dog. It’s always delightful to hear about what you are doing. Here’s a pat from me. Wishing you and your family a very Merry Christmas and a fantastic New Year. Hobbs and Peaches here. We would check out the packages but mom told us we will have bones , and mom is making smelly mackeral treats which we love. Have a Merry Christmas unwrapping your gifts. Merry Christmas Madison and to your Mom as well. Tell her to try using an old rotary blade (in a rotary cutter) when she wraps presents. It’s much easier than tearing and/or cutting. Annabelle and Shadow (Border Collies), TN. 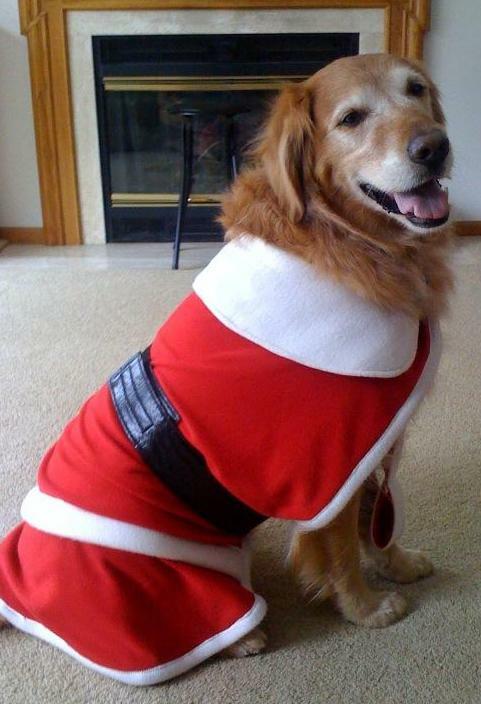 Santa Doggie, and hurry down the chimney tonight! Love you Santa Doggie!! Come see me and my brother Shakespeare!! Besides enjoying the very precise performance, and the Hallelujah chorus…. it was a delight to hear the laughter of the audience. I’m sure God was enjoying it too.! Thanks, Ami. What an AWESOME Santa suit you have Madison ~ your mom is SO talented! Happy HAPPY Holidays to each of you and many, many blessings for the coming year!!! No way would my Mom get me in a coat – although, for a dog, you don’t look too bad (ha, ha, ha!) I get to help sew – I bring any dropped straight pins right to my food bowl so Mom can find them and I make sure I leave fur on her projects so she doesn’t forget me. I supervise all her sewing! Well, Madison, hope you and your Mom have a great Christmas – don’t let her put a red nose and antlers on you – even a dog has to draw the line somewhere! Jackie O’Lantern, the alpha cat! This is MIssy, Uncle Bud’s dog, replying. I guess I am not the only dog that can use a computer. There are so many clever pooches our there! We ought to organize. I thought your pictures were great. You look so good. I haven’t seen or smelled you for such a long time. I want to wish you and your humans a very happy holiday season. I really appreciate what you do for Ami and also all of us dogs and cats. 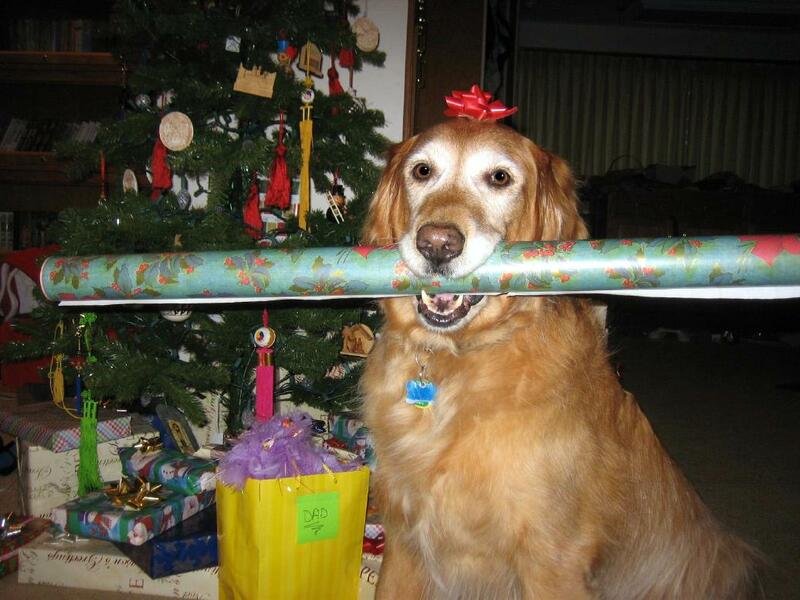 Belated Merry Christmas to you Madison, and to your humans also. We don’t have such nice coats as you do, but we do have headbans that aren’t to bad for the two minutes they stay on. Our Mama and Papa don’t make us wear them. Maybe our Mama will see your handsone Santa coat and make them for us for this coming Christmas. Our squirrels eat from the bird feeders, so they don’t get their own feeders. They never let us come close to give them kisses either. I like the one where they are further apart.